The key thing is to be working on efforts where there is significant R for the I. Not the low hanging fruit. That requires determining the probable I before you start. That also requires determining the probable R before you start. Both. 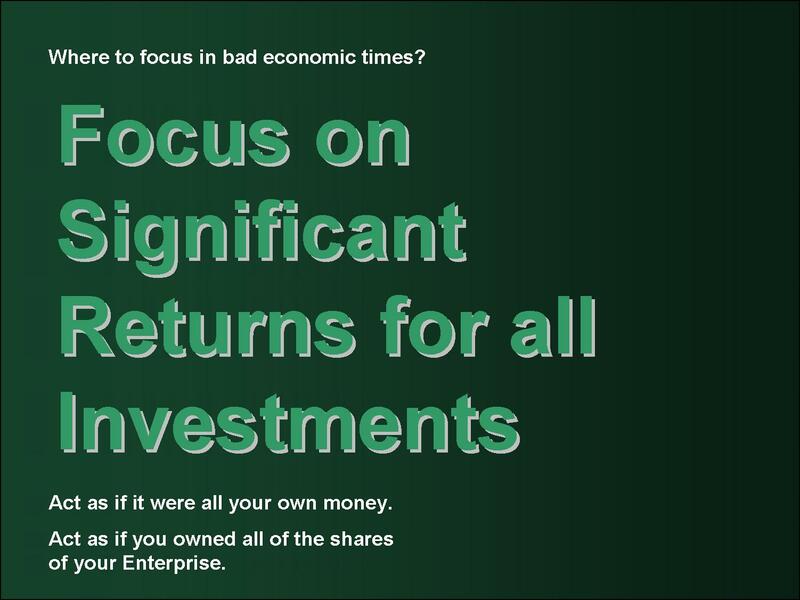 Unless you are flush with cash and need to spend it rather than return it to the owners in dividends, etc. Not likely. Determining the probable Invest Costs should include everything compared to doing nothing at all. Determining the probable Returns Values should include everything compared to the results from doing nothing at all. Determine the R before the I, and then immediately skip Rs where the R-bang isn’t going to be BIG ENOUGH regardless of the size of the I. Small I mean. Small Is have nothing to do with the decision – unless you are down to your last I capability. 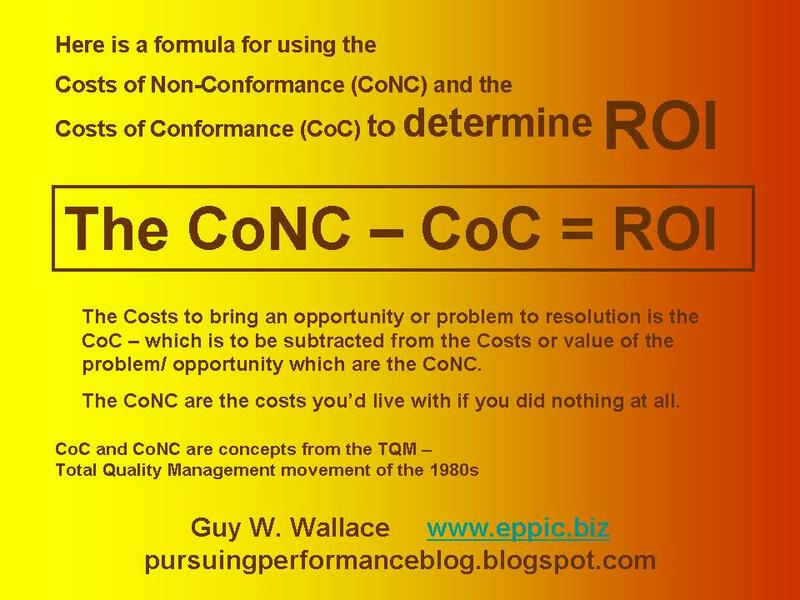 Determine the CoNC first – and then the CoC. Show the CoNC first – and then the CoC. It scares people less that way – the investment costs required that is. The Customers/Clients and Other Key Stakeholders! Are you aligned to them – in sync? Here is a prior Blog Posting about that. Oh- and I think there is a wide difference between HPT and HPI. Human Performance Technology and Human Performance Improvement. HPI – the “brand name for “it” of ASTD” is really all about the people’s knowledge and skills – whether put in place by selection, development, etc. But its focus is on people enabling. HPT – the “brand name for “it” of ISPI” is really about everything that impacts human performance – regardless if that human performance is “performance” represented at the level of Society/Humanity, the Enterprise/Organization, the Process/Workflow, and the Learners/Performers. HPT includes Lean and Six Sigma approaches/methods because they work at the Process/Workflow level of human performance. Human Performance in an HPT is all encompassing – because humans direct and control (or don’t) all of the activity that rolls up to the P/W, E/O, and S/H levels. Getting that aligned is what ISPI’ers talk about, argue about, debate about (more civilized than just arguing). And as Don Tosti remarked – all business processes and systems are human performance systems. We aren’t at the point where it is systems/processes/machines created by systems/processes/machines – they were created by humans to perform in place of or to better enable humans. ISPI’ers like Roger Kaufman and Mariano Bernardez and Dale Brethower advocate for a look at Mega first – get aligned to what the Society/The World level needs as a whole. Then develop your Enterprise/Organizational charters, missions, visions, values, yada, yada, yada. ISPI’ers like Don Tosti and Bill Daniels and Jim Hill advocate for improved competence of the Enterprise/Organization level. ISPI’ers like the late Geary Rummler and Alan Ramias and Ray Svenson advocated for improved competence of the Process/Workflow level – aligned appropriately to the needs at the higher levels. ISPI’ers like Ruth Clark and Judy Hale and Harold Stolovitch advocate for improved competence of the Learner/Performer/Individuals and Team levels. It’s all good. All points of view are valid. Not everyone is “in charge” – some are in the trenches. Their needs are different. We work interconnected with people who work at various levels of Performance Improvement. The 2009 ISPI Spring Conference in Orlando – April 19-22. Come to learn from some serious folks – who don’t always take themselves so seriously. Well, most of the time anyway. And again, I don’t mean to suggest that anyone named above focuses only on one level. No way Ray!